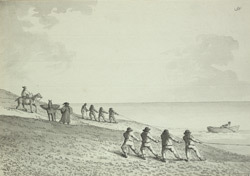 A view of fishermen on Chesil Beach in Dorset. The beach is distinguished by its very hard pebbles, many of which consist of quartz or chalcedony, which makes them tougher than steel. The beach is some 18 miles long, and subject to different intensities of tidal activity at various points. Thus the pebbles get larger as one travels along the beach in a south-easterly direction.